Eddie Blumenthal raised to 84,000 preflop on the cutoff and Noah Schwartz reraised to 250,000 on the button. Blumenthal called and the flop was dealt A 6 5 . Blumenthal moved all in and Schwartz. The two players then flipped over their cards. 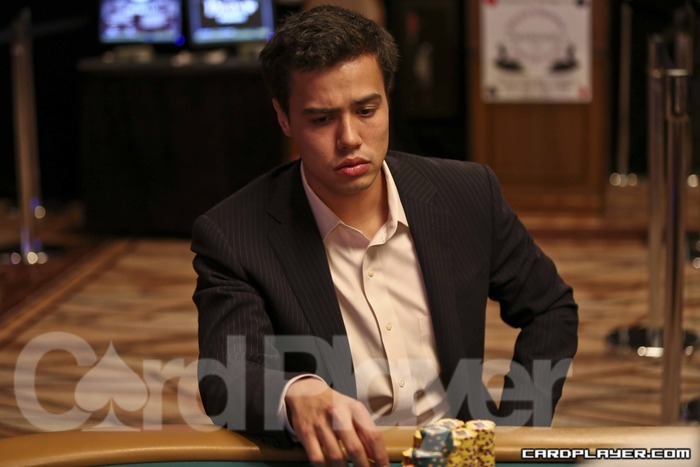 Schwartz won the hand to grow his stack back above 850,000 and Blumenthal was eliminated in seventh place. Eric Shanks raised to 50,000 on the button and Josh Pollock reraised to 162,000 on the small blind. Shanks reraised the pot and put himself all-in in the process. Pollock called and they flipped over their cards. Pollock made a flush to win the hand and he was above 1 million with the chip lead. Shanks was eliminated in sixth place. The final table of Event No. 22 ($1,500 Pot-Limit Omaha) has begun, and Card Player will be posting level-by-level updates with all major hands, current chip counts, and prize payouts. Jun 09, '13 2013 44th Annual World Series of Poker Event 15 - $1,500 H.O.R.S.E. Eddie Blumenthal completed and Rep Porter raised. Blumenthal called all in, and then the rest of the cards were dealt. Porter made trip sevens to win the high and since neither player qualified low that was enough to scoop the pot. Blumenthal was eliminated in seventh place and Porter was up to 800,000. Ryan Lenaghan raised the pot to 30,000 from middle position, Gregory Jamison called from late position and Phil Ivey called from the big blind. The flop came A J 7 , Ivey checked, Lenaghan bet all in for 12,000, Jamison raised to 27,000 and Ivey folded the side pot. Lenaghan was all in for his tournament life and was ahead on the flop with top two pair against Jamison’s wrap around straight draw. The turn and river were the Q and the 5 , giving Jamison the nut straight on the turn to win the pot and eliminate Ryan Lenaghan in 9th place ($26,940). The remaining 8 players took a one hour dinner break at the completion of Level 23 and will return at approximately 9:30pm local time to resume play. 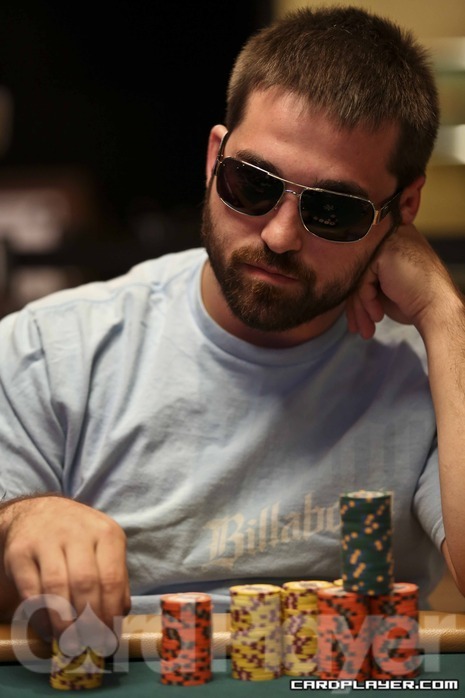 Foster Hays was left on the short stack after Bertrand Grospellier was eliminated last level, but managed to double up through Eddie Blumenthal early in Level 26. Eddie Blumenthal opened the button for 64,000, Foster Hays moved all in for 605,000 from the small blind and Blumenthal called. 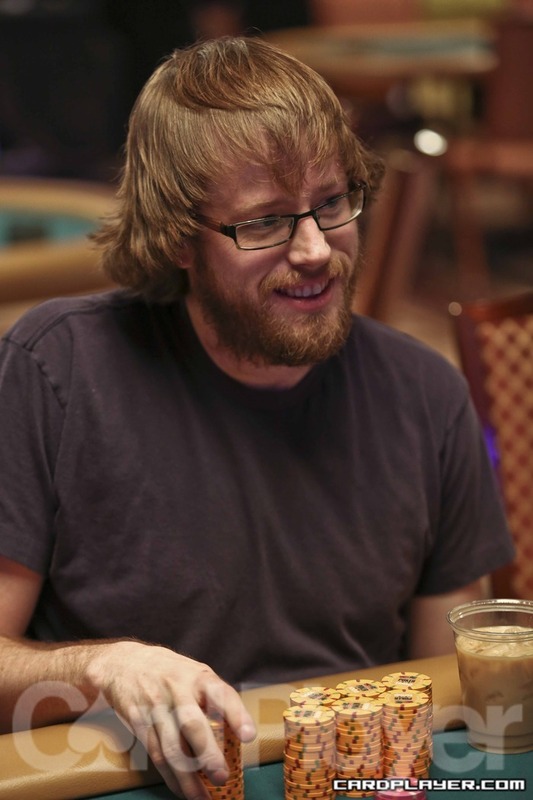 Hays was all in for his tournament life and trailing before the flop with Q J against Blumenthal’s A J . The board came Q 9 6 9 J , giving Hays top pair on the flop to win the pot and double up. Hays moved up to about 1.3 million that hand while Blumenthal was put on the short stack with just under 1 million. The remaining five players took a one hour dinner break at the conclusion of Level 26 and will return at approximately 9:10pm local time to resume play. The final table of Event no. 23 ($3,000 No-Limit Hold’em Six Handed) is now underway, and Card Player will be posting level-by-level updates with all of the action, current chip counts, and prize distributions. Day 3 began with 18 players spread out over 3 tables, and with the elimination of Scott Montgomery in 7th Place ($49,214), the official 6-handed final table is now set. Play will begin in Level 24 with blinds of 10,000-20,000 with a 3,000 ante, and will continue until a winner is determined.